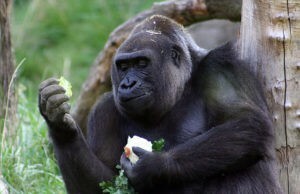 A gorilla named John Aspinall is one of the central characters in The Life Tree picture. Here at Life Tree HQ we find these majestic animals simply fascinating. So for our interest and yours we have compiled a few interesting facts about gorillas that you might not know. 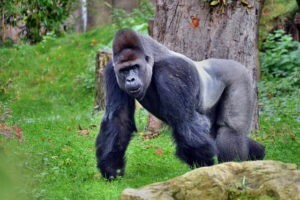 (1) There are two species and four subspecies of gorilla. One species is the Western gorilla with the subspecies of the western lowland gorilla and the cross river gorilla. The other species is the Eastern gorilla with the subspecies of grauer’s gorilla and the mountain gorilla. (2) All species and subspecies of gorilla are extremely endangered with only around 130,000 left in the wild. The most numerous group are the western lowland gorillas with numbers in the wild estimated at around 100,000. The least numerous group is the cross river gorilla with numbers in the wild thought to be no more than 300. (3) Wild gorillas are native to Africa and can be found in parts of nine African countries including Angola, Cameroon, the Central African Republic, the Democratic Republic of the Congo, Equatorial Guinea, Gabon, Nigeria, Rwanda and Uganda. The main threat to them comes from destruction of their habitat and mining. (4) Human beings and gorillas are very closely related with 98% of gorilla DNA being identical to human DNA. (5) Gorillas are highly intelligent and very peaceful animals. They have over 25 different sounds with which they communicate (mainly different grunts and grumbles). They also communicate by means of subtle changes in body language. They are effective problem solvers and use tools. 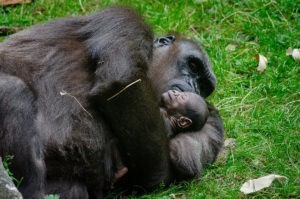 (6) Gorillas are terrestrial which means that they spend most of their time on the ground. Whilst they can and do climb trees this is not where they spend most of their time. (9) Gorillas have unique noseprints rather like our fingerprints, each one is individual and can be used to identify different gorillas. 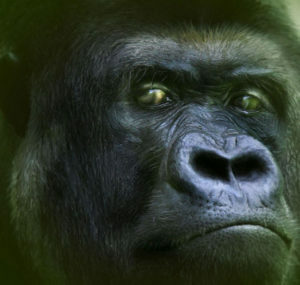 (10) Gorillas live in family groups. Females will only tend to produce one baby every 4-6 years and a gorilla infant is dependent on its mum for quite a long time. Whilst gorilla mothers provide most of the “child care” – even sharing their sleeping nests with their infants for the first few years, gorilla fathers do also play an important role, mainly in socialisation. There have been occasional cases of gorilla twins being born – we imagine they must keep their mums very busy! We hope that the growth of ecotourism will ensure the ongoing protection of gorillas so that they can continue to survive in the wild. The increasing popularity of socially and environmentally responsible tourist trips, including controlled and guided trips to see gorillas, can be an important way for local people to benefit from living in close proximity to gorillas. It’s estimated that one mountain gorilla can indirectly generate £2.5 million over its lifetime from tourist income. For more information about these amazing animals check out the Dian Fossey Foundation or the World Wildlife Foundation. Over the coming months we will be learning more about the other amazing animals who live in The Life Tree so remember to keep checking in to the blog!